One of the common questions or comments we get on PF is the claim that classical physics or classical mechanics (i.e. Newton’s laws, etc.) is wrong because it has been superseded by Special Relativity (SR) and General Relativity (GR), and/or Quantum Mechanics (QM). Such claims are typically made by either a student who barely learned anything about physics, or by someone who have not had a formal education in physics. There is somehow a notion that SR, GR, and QM have shown that classical physics is wrong, and so, it shouldn’t be used. There is a need to debunk that idea, and it needs to be done in the clearest possible manner. This is because the misunderstanding that results in such an erroneous conclusion is not just simply due to lack of knowledge of physics, but rather due to something more inherent in the difference between science and our everyday world/practices. It is rooted in how people accept certain things and not being able to see how certain idea can merge into something else under different circumstances. Classical physics is used in an overwhelming majority of situations in our lives. Your houses, buildings, bridges, airplanes, and physical structures were built using the classical laws. The heat engines, motors, etc. were designed based on classical thermodynamics laws. And your radio reception, antennae, TV transmitters, wi-fi signals, etc. are all based on classical electromagnetic description. These are all FACTS, not a matter of opinion. You are welcome to check for yourself and see how many of these were done using SR, GR, or QM. Most, if not all, of these would endanger your life and the lives of your loved ones if they were not designed or described accurately. So how can one claim that classical physics is wrong, or incorrect, if they work, and work so well in such situations? What actually is true is that we discovered a more accurate, and more general description of our world. In this description, it turns out that classical physics appears as a “simplification” or “approximation” whereby it becomes more and more valid as various parameters approach the common, everyday, terrestrial values. And this is an extremely important point to remember, because since classical physics works under our ordinary situation, any new theory or description must somehow converge and look like the classical physics description under such ordinary conditions. Otherwise, this new theory must show that it produces the same set of results as classical physics for all of our known phenomena that classical physics can already accurately described. So in this part of the article, I will show two specific examples where the more general theory of SR and QM merge smoothly into the classical physics form when one adopts the appropriate approximation. This means that at some limit, both SR and QM description will be the same as the classical description. The reference frame S’ is moving with velocity v with respect to reference frame S. A vessel is moving with velocity v’ with respect to S’ frame. What is u, the velocity of that vessel with respect to frame S? The “normal” way to find this velocity is using what is known as Galilean transformation. Here, since both v and v’ and in the same direction, the velocity of the vessel with respect to S frame is a simple addition, i.e. Keep that result in mind. Now this looks different than the Galilean transformation that we are used to in Eq. 1. This works for reference frame S’ at any velocity v, even if it approaches c. At that value, Eq. 1 does not work, and the velocity addition that we are used to fails miserably. However, what happens when v«c, i.e. when reference frame S’ moves much slower than the speed of light? This is what we normally encounter, i.e. someone moving in a vehicle or an airplane. For v«c, Eq. 2 simplifies quite a bit. Without having to do any kind of Taylor series expansion on the denominator of Eq. 2, we can already see that the ratio vv’/c^2 « 1, i.e. it is a very small fraction less than one (v’ cannot be greater than c). This means that, to a good approximation, the denominator of Eq. 2 is essentially just 1. When that happens, Eq. 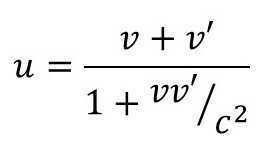 2 then simplifies to u = v + v’, which is exactly Eq. 1! We got back our familiar result when we apply the more general equation (Eq. 2) to our normal, terrestrial condition! This means that all of the velocity addition equations and concepts that we already know using Galilean transformation are derivable from the more general Lorentz transformation equations. The Lorentz transformation is the more accurate, more encompassing description of velocity addition, while the Galilean transformation, which is what we know and are familiar with, is simply a special case for when the other reference frame is moving much slower than the speed of light. Eq. 1 isn’t wrong. It has a limited range of situation when it is valid or accurate enough. This familiar equation can actually be written in a more general form, which is in terms of the time rate of change of momentum p, i.e. We also know that force F can be related to the potential energy (V) gradient, i.e. Here, H is the Hamiltonian, Q is an operator representing any observable, the square bracket represents the commutator, while the angled bracket represents the average value. These are all the standard notations used in QM. This says that the time rate of change of the average value of the momentum p is equal to the average of the gradient of the potential energy V. But this equation is equivalent to Eq. 3 and 4 from classical mechanics! They have identical form! It says that what we typically measure in our everyday lives are really the “average” values of many, many, many values at the QM level. The QM description has made the connection to the classical description under the condition that the QM observables have been averaged. Again, as in the case of velocity addition, we get back the classical description from a more general starting point, in this case a QM description, upon applying a particular condition to the QM picture. It shows that the classical picture is not wrong. It is the average over a large number of QM observables. Classical physics WORKS for our ordinary situation, so it HAS to be valid at some level. Classical physics has been shown to be derivable from SR and QM under special conditions that apply to our ordinary situation. Any theory MUST have the ability to show that it merges to the classical description when applied to ordinary situation. This can only be shown mathematically. It cannot be shown convincingly via hand-waving or qualitative arguments. It is the equivalent mathematical form that shows that one theory can derive the other. What this implies here is that, if there are more general and more accurate theories beyond QM, SR/GR, then those theories must also show that they can be “simplified” into the mathematical forms of QM and SR/GR. Subsequent, more general theories must show that they can derive the mathematical forms of existing, already-working theories. The inability to do that will be a fatal flaw in any new theory. I mentioned towards the beginning of this article that the inability to comprehend this concept of a more general idea merging and agreeing with something less general may have something to do with the differences between science and our everyday lives. It is unusual for many people to accept the possibility that a simplistic, less sophisticated, and apparently different idea is actually a subset of a more general principle. The fact that one can actually start with a more general principle, applies certain criteria, and then get a seemingly different concept, is not something a lot of people are familiar with, or would even accept. It is why for someone not trained in physics, the idea that classical mechanics can actually be derived from seemingly a different animal of QM or SR/GR would not even cross his/her mind. Yet, in science/physics, this is quite common. We always show how new ideas and theories will turn into the old, tested, and well-known ideas and theories under the appropriate parameters. It is very seldom that old theories are discarded wholesale. – "Classical physics is used in an overwhelming majority of situations in our lives." so what? do examples prove that a theory is correct? this argument makes no sense at all. – "any new theory or description must somehow converge and look like the classical physics description under such ordinary conditions.". Who said this "must" be true? The point here is that SR and QM deal with different concepts of reality which are not accounted in classical mechanics. We are looking at the old theories with our "present" eyes. We can't interpret the past this way. The assumptions are totally diferent. – "They have identical form!". Again: having the identical equation form proves what? that they have the same assumptions? that they work on the same space with the same properties? of course not! It does not matter if you derivade classical physics from modern theories, they have different assumptions! they do not talk about the same thing! – "any new theory or description must somehow converge and look like the classical physics description under such ordinary conditions.". Who said this "must" be true? If a new theory does not produce approximately same answers as the classical theory in the realm where the classical theory has been tested experimentally and demonstrated to be accurate than that new theory must not be correct. Experiment is the final arbiter of correctness. Another great Insight, thanks Zapperz! If a new theory does not produce approximately same answers as the classical theory in the realm where the classical theory has been tested experimentally and demonstrated to be accurate then that new theory must not be correct. Of course the new theory will have to explain the old stuff, but it does not mean that it will "converge" at some point to the old one. there is no connection between the two things. – Newton considered space as an R³ euclidean and time as absolute. – Mass and energy were not connected the way we know now. – How would we explain the double slit experiment? The assumptions can't be ignored. I think you are rather missing the point. If you are travelling at 30mph down the road and a car passes you going 30mph faster, you can calculate its road speed using Newtonian or Einsteinian relativity. You will get the same answer to the precision you can plausibly measure. You need to take into account the velocity variation from flies crashing into the front of the car long before you need to care about Einstein. So simplifying the maths and using Newton isn't wrong. How can it be? Unless you're saying it's wrong to neglect the flies. And if you believe that then you will get nothing done ever. I never said that Newtonian mechanics was wrong. never said that. I said that there is no such a thing as a convergence from a new theory to an old one based on some arbitrary limit as they start from different assumptions. So your objection is to the term "convergence", taken as an indication that the new theory must, in the appropriate limit, be precisely identical to the old theory and not merely identical to within current experimental uncertainties. We also know that they are not complete. Although they are well tested in some domains, in others uncertainties remain about their detailed application. Indeed, we expect that they will be modified or extended to explain new evidence. But they will not disappear; just as Newton's laws did not become invalid when we understood special relativity, but rather were seen to be a very accurate approximation under well-defined conditions. Theories such as those listed in the previous paragraph are strong enough that we can use them to say we know certain things – we know that protons and neutrons are composed of quarks and gluons, we know the relationship between mass and energy, we know that Earth's surface is not a single rigid structure. These are facts, but not just simple observational facts. They come from the amalgam of observation and theory development and testing that is the essence of scientific knowledge development. It diminishes the status of our understanding greatly to say that scientists "believe" these things. We know them! When we seek to extend and revise our theoretical frameworks, we make hypotheses, build models, and construct untested, alternate, extended theories. These last must incorporate all the well-established elements of prior theories. Experiment not only tests the new hypotheses; any unexplained result both requires and constrains new speculative theory building – new hypotheses. Models, and in the modern world computer simulations too, play an important tole here. They allow us to investigate and formulate the predictions and tests of our theory in complex situations. Our hypotheses are informed guesses, incorporating much that we know. They may or may not pan out, but they are motivated by some aspects or puzzles in the existing data and theory. We actively look for contradictions. There is an under-emphasis of the significance and importance of the claim that "it works!". Nothing is more powerful than having experimental evidence, and having it being verified and used every single day. Sure, as an experimentalist, I am probably very bias towards experimental evidence. However, this is what clearly separates science from non-science, and what makes acceptance in physics extremely difficult due to the requirement of having clear and convincing empirical evidence. do examples prove that a theory is correct? Obtaining examples where a theory works or doesn’t work is the whole purpose of experiments in the scientific method. We don’t usually use the word “prove”, but examples do verify or falsify theories.